Welcome the Season of Light at a community celebration of holidays from around the world! Connect with friends, family and neighbors at the Season of Light Multicultural Holiday Celebration on Saturday, Dec. 1, from 5 to 8 p.m., at the Pigeon Community Multicultural Development Center in Waynesville, North Carolina. Guests at the drop-in, family-friendly event enjoy hors d’oeuvres from cultural celebrations and learn about traditional music, games and customs of Advent, Diwali, Hanukkah, Fiesta de la Griteria, Las Posadas, Winter Solstice and Kwanzaa. The evening concludes with a dessert bar and singing of “This Little Light of Mine” by candlelight. Admission to the event is $10 for ages 13 and older, $5 for ages 6 to 12, and free for children 5 and younger with two nonperishable food items to support the center’s emergency food box program. 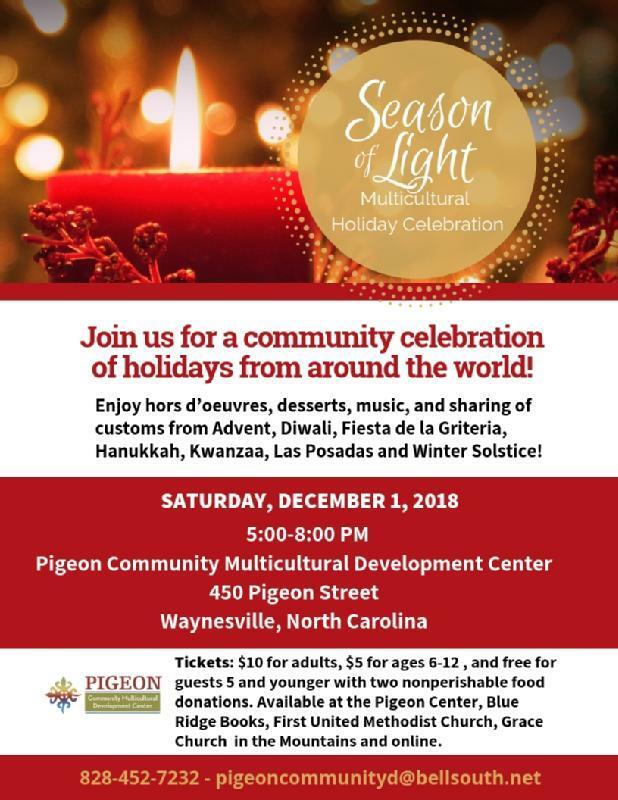 The Pigeon Center is located at 450 Pigeon St. in Waynesville, North Carolina. For more information, visit pcmdc.org, email pigeoncommunityd@bellsouth.net or call 828-452-7232.